French president Nicolas Sarkozy is fighting for his reelection not only on the campaign trail, but also on the web. The mastermind behind Sarkozy’s web campaign is Nicolas Princen, his advisor for New Media and Information Technology. The 28-year old who some called “Sarkozy’s little cop” and “”Sarkozy’s eye on the net,” has proven to be highly effective, and is responsible for building the president’s online presence. Evidently, there is no one else more qualified than him to speak about the secrets behind the president’s web persona. Luckily, he was a guest at Sciences Po’s School of Journalism recently, and explained what it has taken to build the president-candidate’s online campaign. Nicolas Princen, advisor for New Media and Information Technology for French President Nicolas Sarkozy. 1) Make the president’s achievements known. 3) Share with people the experiences from the campaign, and the behind-the-scenes. 4) Tell the president’s message. Sarkozy’s official site: www.lafranceforte.fr/, is the anchor of his web campaign. The site offers information about the president, why he’s decided to run again, an assessment of his policies since 2007, his campaign’s agenda, news and links to his social media accounts. 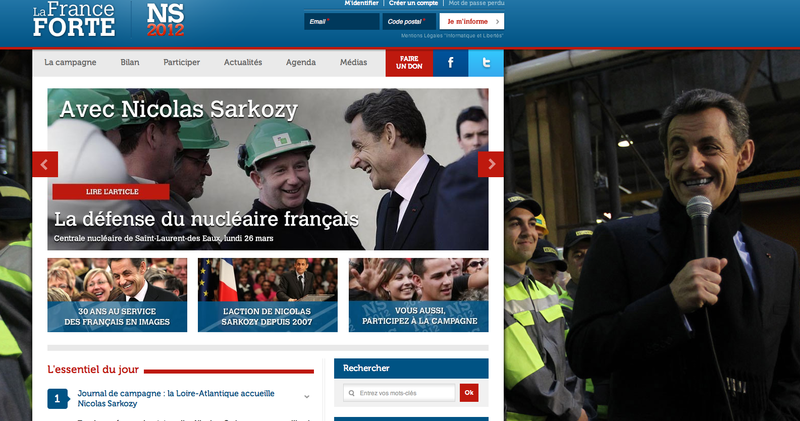 Nicolas Sarkozy's official campaign website: "La France Forte" (A Strong France). Visitors may sign-up to receive the latest news from the president-candidate’s campaign by providing their e-mail address and postal code. In addition, visitors have the option to register as users of the page. This functionality of the website is called “NS Connect” and once a user is registered, they have the opportunity to connect to participate in a Foursquare-like game that allows users to earn badges as they accomplish different tasks. The first badge that registered users can acquire once they sign up to "NS Connect"." Aside from the official site, Facebook plays a key role in the president’s web campaign, according to Princen. I consider that Facebook is an absolute priority. Why? Because almost half of all French people have one. The official count is 25, though it might be more like 27 million, almost half of the country. The efforts behind the French president’s Facebook pages seem well worth it. In fact, he has not one, but two. On the Facebook page explicitly tied to his campaign, he has more than 590,000 Likes. These approximately 600,000 French people are his fans, support him and want to know about him on a daily basis. On his, let’s say, more personal page as president of France, he has 85,000 subscribers. (These numbers represent a huge advantage over his Socialist rival François Hollande, who has seven times less fans). French president Nicolas Sarkozy's Facebook Page. Princen said he notices that “Sarkozy’s supporters are extremely vocal and present.” On Facebook, this is certainly true. Any status update that the president posts gets thousands of Likes and comments, and usually, a couple hundred shares. Sarkozy's status updates receive thousands of likes and comments. While it could be said that Facebook is his strength as far as social media is concerned, the same cannot be said of Twitter. The president has almost 60,000 less followers in his Twitter account than Hollande. It is said that there are about 5 million people in France who use Twitter, I would say more like 3 million, with some thousands actually active. But what I think is interesting is the quality of engagement. It is not the same thing to follow someone on Twitter, which is an indication of interest, than to actually “like” someone on Facebook. It doesn’t mean that everyone who “likes” Sarkozy on facebook is in love with him, but it’s an indication of real support there… It’s a different kind of indicator than that of Twitter. But, does the president himself, tweet? The answer is no. Princen explained that the candidate does not even have the Twitter app on his smartphone. In fact, “he doesn’t manipulate this type of tool.” (The French president does have an iPad however). There are two types of (Twitter) messages: those that come from the team, all those that provide information about the campaign or, of the “location” of the president of the Republic at the moment, or about what he’s saying during a speech. Those are all written and approved by the team that is in charge of that. The messages that come directly from Nicolas Sarkozy, are communicated because he himself makes the suggestion that he wants to communicate something about a specific subject on Twitter. Aside from Facebook and Twitter, the president is also present in other social media sites, including Instagram and Foursquare. He uses both to reach voters and keep them informed of his activities on the campaign trail. I will discuss those in an upcoming post. Las alusiones españolas de Sarkozy suenan a desesperación. El primer día que nos emparejó con Grecia como ejemplo del riesgo que Francia no puede correr (bajo gobierno socialista, bien sur), coincidió con la aparición en “Le Monde” de la encuesta Ipsos que le da perdedor en las presidenciales de mayo, con 10 puntos de ventaja a favor de Hollande. La primera vuelta repartirá el voto entre las diez opciones concurrentes, con dos puntos a favor del presidente sobre el candidato socialista. En segunda vuelta, el reagrupamiento del sufragio atribuye al aspirante una mayoría del 55% y deja al titular en el 45%. Hollande sumará a los suyos el 80% de los votos conseguidos en primera por el izquierdista Melenchon, el 40 del centrista Bayrou y –sorpresa, sorpresa– hasta el 16 de la ultra Marine le Pen. A Monsieur Sarkozy le viene grande el Toisón de Oro recientemente otorgado por el rey de España, y grandísima la propia Francia en crisis. Desde De Gaulle hasta hoy, pocos presidentes de la V República han tenido, como él, un solo mandato. Ya puede compararse con Bush padre. ¿Cómo compensar la irresistible ascensión del socialista? Pues entrando a saco en la verdad y la objetividad. España no ha pedido el rescate de la UE, mientras que Grecia se prepara para el tercero después de que el presidente derechista impuesto para evacuar a Papandreu no durase ni dos telediarios. E Italia, que ha sufrido a Berlusconi hasta el nombramiento, que no elección, de Monti, ni siquiera es citada como ejemplo del desastre que el francés atribuye a Zapatero. Increiblemente, pues, Sarkozy se apunta al disco rayado de la “mala herencia” que repite Rajoy cuando se asusta del efecto de sus medidas y reformas. Buen termómetro, éste, de la vacilante fe del español en sí mismo. Y extraña, muy extraña, la alegría con que el PP interpreta los deslices del francés como excluyentemente referidos al pasado gobierno de Zapatero, aunque los españoles seamos los mismos, víctimas potenciales, hoy como ayer, de la desconfianza agravada por la frivolidad del inquilino del Eliseo. Para calificar todo esto basta una palabra, igual en francés que en castellano: deplorable.